Finally, you can see the Curiosity Rover land in your front yard and the MAVEN spacecraft hover over your roof. NASA has released a new-and-improved version of its Spacecraft 3D app to coincide with the second anniversary of Curiosity's landing on Mars. The updated app has added Curiosity's Descent Stage, MAVEN and two antennae from the Deep Space Network (with pointing controls). 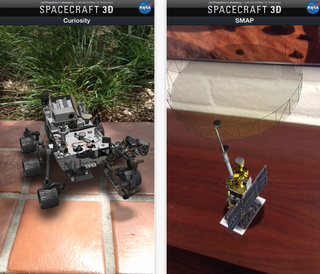 Available for both iOS and Android mobile devices, the app can be downloaded from NASA's Jet Propulsion Laboratory.